The intensity of the political shortcomings throughout the Cold War provided great inspiration for satirists, as demonstrated the film Dr. Strangelove (Kubrick, 1964) which parodies ineptitude and technology. Although these themes are addressed throughout the film, they are particularly tangible in the film’s climatic scene of Major T.J. “King Kong” (Slim Pickens) fixing the bomb doors of his B-52 and falling to his death while riding an explosive like a bull. Research and scene analysis prove that Dr. Strangelove’s mockery of political incompetence and technological dominance are most clearly demonstrated through Major Kong’s patriotic but foolish struggle to fix the doors to release his plane’s bomb, followed by his rodeo-like fall to global destruction which serves as the culmination of the film’s plot and its objections to the Cold War. In particular, the contrasting humor and tragedy of the scene yield it as a means to ensure viewers retain the film’s messages. Kong’s struggle with the bomb is arguably the most significant instance in which the film’s warnings against political incompetence and technological omnipotence are demonstrated. The scene begins with one of the only examples in which a machine fails to work: the doors that will release the bomb will not open. Determined to blow up “the Ruskies,” Kong leaves the B-52’s cockpit, drops in between the two explosives and mounts “Hi There” to reach the control panel above the bomb. The major’s ineffectiveness is illustrated as he fails to fix the crackling electronics, with sparks and ceiling tiles falling onto him. He pokes the cables with a screw driver, but he does not seem to understand what he’s doing; at one point, Kong simply slaps the ceiling with his cowboy hat (see fig. 1). However, in spite of his naïve ambition, Kong is almost portrayed as courageous. His facial expression is not panicked, but determined, wiping sweat from his forehead as he tries to fix the doors (see fig. 2). Additionally, he fulfills his duty to an instrumental of “When Johnny Comes Marching Home” that plays throughout the scene. The song adds to the fortitude of Kong and reveals the patriotism the major feels while completing the task. Nonetheless, by sitting on the explosive Kong is either accepting a high risk of death for a cause Kubrick mocks throughout the film, or he is oblivious to the dangers to which he is subject. Subsequently, Kong’s patriotism is not as much admirable as it is foolish. Additionally, he is shown to underestimate the power of technology. Much of his struggle is filmed from a low-angle, almost as if the audience is taking the perspective of the bomb to watch him fix the doors (see fig. 2). From this view, the camera slightly sways and the flashlight around Kong’s waist points directly into the lens, obscuring the major’s work and further emphasizing his difficulty in gaining control over technology. Just as Kong seems to identify the issue, clipping a specific cable with pliers, he looks beneath him to find that the doors have already opened. The drums of “When Johnny Comes Marching Home” fade into the howling of the wind and the screaming Kong. At first, the major’s reaction does not seem illogical: he appears to panic for the first time in the whole scene, identifying his imminent death. However, when the camera cuts from a high-angle above the bomb to a low-angle below Kong’s face, the major is shown with a smile (see fig. 3). From the floor of the bomber’s downstairs, the camera follows Kong and “Hi There” as they drop from the ceiling through to the sky. Lieutenant Lothar Zogg (James Earl Jones) is then shown sitting in the cockpit, casually asking about what happened to Kong. This demonstrates a knowledge gap for both the major and the bombardier, and is the final shortcoming of the men before the explosion: Kong told the crew what he was doing but did not address the urgent issue of how they should respond if he does not return from the bottom of the plane before they reach their target. Zogg’s question is answered with a long take of Kong riding on the end of “Hi There,” falling away from the camera and towards the ground target. As the bomb dives, Kong holds a raised edge with one hand and waves his cowboy hat with the other (see fig. 4). He hollers with an absurd joy that adds to the major’s depiction as a cowboy riding a bull in a rodeo. This scene further develops his futile patriotism, but most significantly, it represents all of the “… men who have stopped worrying, i.e. thinking and feeling, and learned to love the bomb…” (Burgess 10). Just as Kong and “Hi There” approach the ground, the camera cuts to a blank grey screen, creating a brief second of uncertainty before fading into a wide shot of a nuclear explosion. The United States and Russia failed to devise an effective plan in averting the nuclear disaster, and the film peaks in a comedic, absurd tragedy (Carringer 47). Kong’s death and the explosion of “Hi There” serve as the pinnacle of the film’s warnings about incompetent militarism and governing, and living “…the hands of totally amoral technological Science…” (Burgess 10). Straightforwardly, Kong’s paradoxical enjoyment of the bomb ride represents the greater absurdity of the film and Kubrick’s implication that the “logic of deterrence” will destroy humanity (Kirshner 41; Shafizadeh 8). Kubrick depicts this notion through the series of escalating irrationalities, beginning with General Ripper’s (Sterling Hayden) belief that the Soviets have contaminated American water with fluoride, prompting him to launch the attack against the Soviet Union. He cuts off communication, and armed forces surround his base, preventing President Merkin Muffley (Peter Sellers) from contacting the General to obtain the recall code held solely by the latter officer. This point leads to two ironies that portray the statesmen as inept: the president-approved failsafe plan is failing and Muffley must send the army into Ripper’s base, where they are promptly attacked by their American peers in the Air Force. Men from the latter military branch (who believe that Russians have attacked Washington) comment on the Americanism of the troops infiltrating the base before opening fire on their peers. The irony of the attack is most blatantly identified with a billboard placed in the middle of the battle ground, reading “Peace is our Profession.” In addition to the Americans, Kubrick also mocks the Russians throughout the film, portraying their most powerful asset (the doomsday machine) as their greatest mistake. The machine is technically perfect and is capable of destroying the world if detonated, but was ultimately made to deter countries from attacking Russia and initiating nuclear war. However, the achievement of this goal is contingent on Soviet leaders performing one function the machine cannot do for itself: announce its presence to the world. Demonstrating Kubrick’s contempt for political incompetence, the totalitarian government fails to tell any other nation of this device and subsequently, it fails to discourage other countries from attacking the Soviet Union (although it does detonate as designed). The shortcomings of both countries – from the doomsday device’s deterrence of nuclear war, to the vetting system permitting a lunatic to order a nuclear attack, to ineffective attempts to mitigate for the situation – lead to the worst-case scenario for the Cold War; however, it is the successes of the film (Kong’s bomb and the doomsday device) that demonstrate sometimes these shortcomings can lead to catastrophic, unintentional successes. Besides its relation to the film’s plot, the scene of Kong riding “Hi There” is also significant in its function as an “image-event” (or, the most powerful and memorable moment of a film), leaving viewers with a vivid depiction of the film’s mockery of the Cold War (Gullien 43). 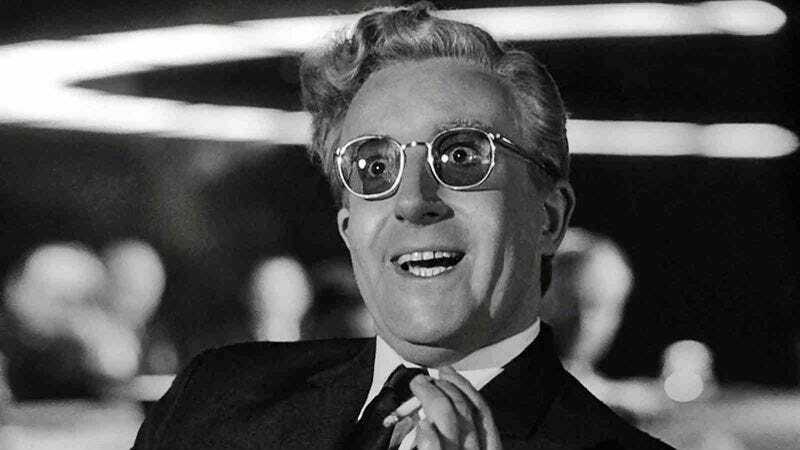 Although Dr. Strangelove was released among other works satirizing war, Kubrick believed that Americans were in denial over the possibility of nuclear conflict (Burgess 9; Carringer 46; Shafizadeh 4). He found this to be an issue “‘…because it’s the only social problem where there’s absolutely no chance for people to learn anything from experience’” (Carringer 47). Subsequently, Kubrick sought to create a film that could inform audiences not only of the insanity of their present political environment, but also its potential consequences. Through his study of the Cold War and the novel Red Alert (on which the film is based), he found it difficult to portray the topic as earnest because of its irrationality (Carringer 47). This notion yielded a “nightmare comedy” of a film, balancing the real (the threat of war) with the humorous (or the depiction of the reality) (Shafizadeh 6). In particular, Kong and “Hi There” are a clear depiction of this paradox: while viewers would not reasonably expect nuclear war to begin with a man riding an explosive like a bull, the scene concretizes the abstract absurdity found in both the bombing and in the premise of the Cold War, effectively communicating Kubrick’s objection to the conflict. Alternatively, the events that lead to the dropping of the bomb are the more literal representations of what could have happened as a result of political incompetence. For example, it is not unreasonable to believe that a lesser official could have abused their power and escalated Russian-American conflict to the point of war (depicted by Ripper’s initiation of Wing Attack Plan R), or that the perpetual “one-upping” between the two nations could lead to a technological disaster (demonstrated by the doomsday device). Kubrick’s use of an extreme and humorous nuclear attack increases the likelihood that viewers will remember the scene and by extension, remember Kubrick’s objections to the Cold War. The outlandish depiction of Major Kong’s death on the back of the bomb serves as not only the climax of the film, but as a vehicle for the film’s warnings against political incompetence and technological power. Burgess, Jackson. “The ‘Anti-Militarism’ of Stanley Kubrick.” Film Quarterly, vol. 18, no. 1, 1964, pp. 4–11. JSTOR. Carringer, Robert. “Kubrick’s ‘Dr. Strangelove’: A Guide to Study.” The Journal of Aesthetic Education, vol. 8, no. 1, Jan. 1974, pp. 43–53. JSTOR. Guillen, Michael. “Hidden Certainties and Active Doubts.” Cineaste, 2015, pp. 42–45. Kirshner, Jonathan. “Subverting the Cold War in the 1960s: Dr. Strangelove The Manchurian Candidate, and The Planet of the Apes.” Film & History, vol. 31.2, 2001, pp. 40–44. Shafizadeh, Nafis. “Then and Now: On Dr. Strangelove or: How I Learned to Stop Worrying and Love the Bomb.” Senses of Cinema, no. 75, June 2015, pp. 1–10. EBSCO. I totally agree with your points, you did a good job. I like your analysis about that: The outlandish depiction of Major Kong’s death on the back of the bomb serves as not only the climax of the film, but as a vehicle for the film’s warnings against political incompetence and technological power. It shows you did a deep thinking of the theme of this movie. You have your own thoughts of what the director want to express. Also, this sentence attracts me to watch this movie, your analysis gives me a feel that this movis likes a typical Hollywood movie, it must be great! It was great to read your review and I feel you gave a very in depth analysis of the major points of the film. I think you very accurately picked apart and discerned the true meaning of the scene when Kong is fumbling with wires and trying to fix the electrical board and saw that as an allusion/ warning about the incompetence of politicians. It was also keen of you to note that Kong’s patriotism comes off as foolish, but to also discern through his facial expressions that he was meant to almost come off as courageous. I think this draws a connection between how politicians truly are and their intentions, versus how they can be depicted. Overall great review and analysis ! Your review on this movie was not only well done but you were able to integrate why politics played a big part in this movie and the meaning of Kong’s role in the movie. One part of your review that I enjoyed reading is when you mentioned the American’s viewpoint towards the Soviets. You say that many Americans tend to blame many of the problems they have on the Soviets, such as the Americans having fluoride filled water. Although this claim is most likely a hoax, the general still goes on to drop a bomb on them. This goes back to what you said about how this movie can be perceived as a mockery of war. Amazing review with in-depth commentary. This review was a pleasant, descriptive, and compelling read. I definitely was able to understand the plot and the major points in this film. You included pretty much every element needed for a great film analysis. You also precisely analyzed this film while still giving the reader a play by play of the plot, which I am highly impressed by. I am also impressed by how you found a way to include your insights about politics and its significance in the film. After reading this film analysis, I truly do have a better knowledge and understanding of this film and want to watch it. I enjoyed your review because I believed it to be cohesive and educational. You explained the depths of the movie very well and explained all the major points of the movie in an entertaining way. I am satisfied after reading your review because I feel you have covered everything you should for a film analysis. You also expressed your opinions while informing us about the film. I thoroughly enjoyed reading your film review and feel educated on this film. I liked how you explained the reasoning behind events in the movie and all of your insight and passion for this particular film. That was a good formal analysis of the bomb riding sequence. Before I had seen Dr. Strangelove, I only knew it from the image of Major Kong riding the bomb. Interestingly, the Slim Pickens was only given the script to his part of the film, and he didn’t know that it was going to be a comedy. After the movie came out, the U.S. government changed policy so that no one person had the ability to launch a nuclear weapon. It is scary to know that events depicted in the film could have potentially been enacted, and ironic that a comedy film has improved global security.